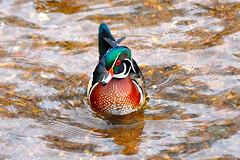 According to Wikipedia, "[t]he wood duck or Carolina duck (Aix sponsa) is a species of duck found in North America. 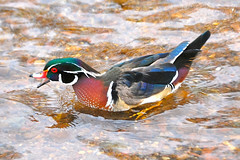 It is one of the most colourful of North American waterfowl." This kind of duck is one of my favorites, because it reminds me an awful lot of my daughter. It is stunningly beautiful, with distinctive plumage and pretty eyes, just like Shae. Since they're ducks, they're excellent swimmers, and I noticed today that they tend to be partial to bread and stale ice cream comes -- not unlike Shae on both counts. They also have great big ol' sass-mouths. 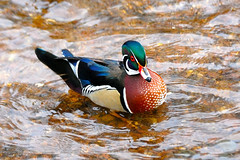 So, you know, my kid is apparently not just part mermaid and part goldfish, but also part wood duck, too.